A few days ago pictures from a photo shoot of artists in all black started popping up on my timeline with all sorts of hash tags suggestive of a collective. While I was still tryna make sense of this the good homey Verseless Philo hit me with a presser about a super group him and a bunch of other talented creatives had come up with. Peharps as a testament to them putting everything on their selves the crew decided to call themselves "Veryus". 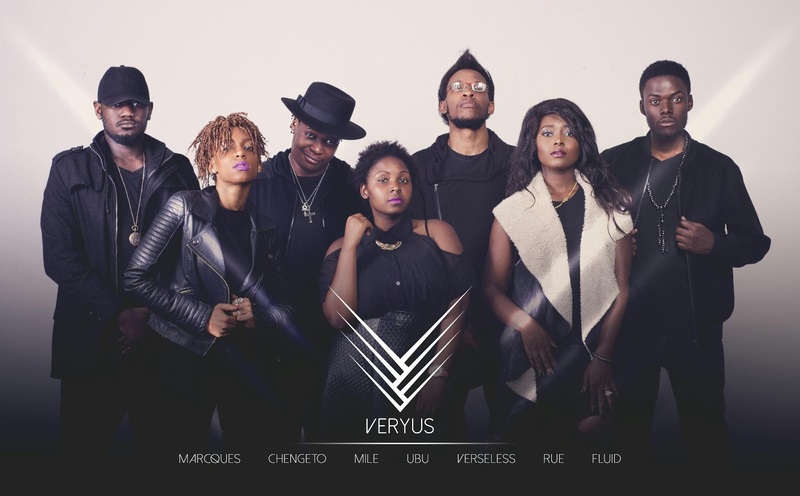 Chengeto Brown, Marcques, Mile, Fluid, Rue, uBu and of course Verseless make up the seven member clique which has already started a marathon release of 7 songs stretching from 1 to 7 March. A quick chat with Verse revealed a few interesting points chief among them being the need to bring back sonic risks to the local music market which means shying away from the traditional sungura, Hip-Hop, dancehall we have become accustomed to. Having listened to the whole body of work from the Veryus stable I can safely say they are succeeding in this regard. One can't exactly pinpoint their genre of choice but its best described as nostalgic feel good pop with a sprinkling of electro. While Verseless was the driving force behind them ganging together even he admits that each member is an essential cog in the machinery that's Veryus. Nonconformity to set blueprints,honesty with each other are some of the guiding principles of this eclectic group of super-talented individuals. Keep y'all eyes and ears on the Verseless SoundCloud and Facebook pages for the awesome music coming your way.